Each week, the PFF analysis team will bring you break downs of the most important match ups for each game of the NFL season. 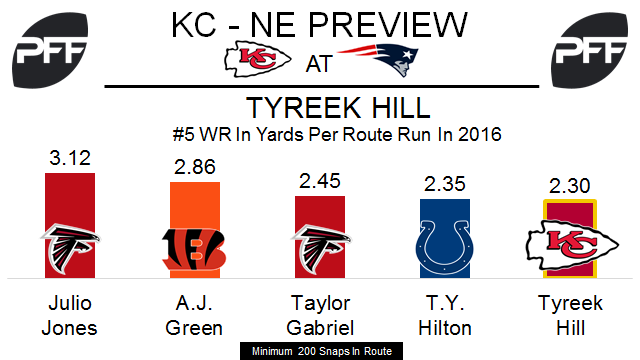 WR Tyreek Hill vs. CB Malcolm Butler – The assumption is that Butler will matchup with Hill most often, with Stephon Gilmore usually covering the bigger Chiefs receiver Chris Conley. In 2016 Hill finished fifth in yards per route run at 2.30 among wide receivers with 200-plus snaps in route. The Chiefs only targeted Hill 12 times on deep passes (targets 20-plus yards downfield), but he hauled in all five catchable targets for 199 yards and three touchdowns. Look for Kansas City to target Hill deep more often this year. Butler allowed 1.15 yards per cover snap in 2016, 36th of 87 cornerbacks with 300-plus cover snaps. He was PFFs seventh ranked cornerback last year with an overall grade of 88.1. TE Travis Kelce vs. S Patrick Chung – The Patriots will likely use a variety of coverages to handle Kelce, including bracketing him with a linebacker underneath and a safety over the top, or occasionally using safety Devin McCourty or cornerback Eric Rowe on him. But Chung should most often draw the tough assignment. Kelce was dominant last year, leading all tight ends that ran 200-plus routes in yards per route run at 2.23. Chung had a career high PFF grade in 2015 at 86.7, but his grade fell dramatically in 2016 to 41.2, ranking 86th of 90 qualifying safeties. He allowed 48 receptions and 518 yards when in coverage, both the third most of any safety. LT Eric Fisher vs. DE Trey Flowers – Fisher has shown gradual improvement over his four year career, finishing 2016 as PFFs 35th ranked offensive tackle out of 79 that played 300-plus snaps. He allowed six sacks and 34 total pressures in 601 pass block snaps, and was 24th in PFFs pass-blocking efficiency ratings. Flowers will move inside to rush on passing downs, but 195 of his 356 pass rushes were from the right side last season. He had seven sacks and 35 total pressures, ranking 67th of 108 edge defenders in PFF pass rushing productivity. 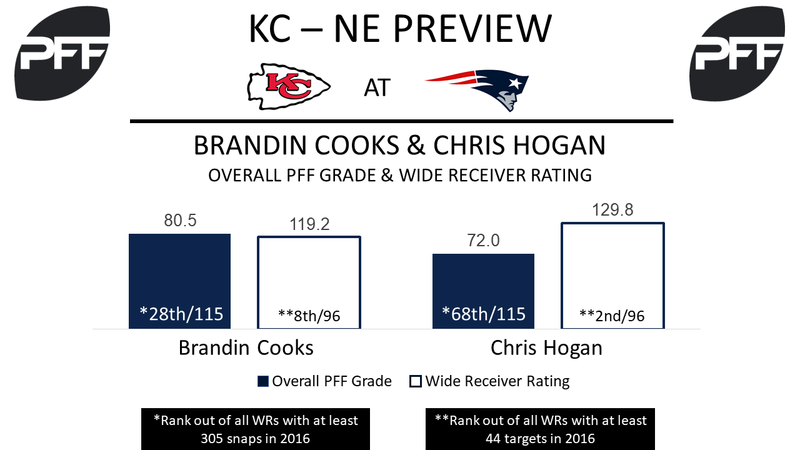 WR Chris Hogan vs, CB Phillip Gaines – Chris Hogan finished the 2016 season with a 0 overall PFF grade. His 129.8 WR rating (the grading quarterbacks have while throwing to a wide receiver) was the second-best in the NFL among qualifying receivers. Hogan lined up in the slot for 37.2 percent of his snaps, a number likely to increase in 2017 with Julian Edelman slated to miss the season on injured reserve; with Terrance Mitchell and Marcus Peters set to start at right and left cornerback, Philip Gaines is the primary candidate to cover the slot. Gaines’ 2016 performance earned him a 34.8 PFF overall grade, and his 2.71 yards allowed per slot coverage snap was the 5th most among 271 cornerbacks to play at least 30 snaps. This could be a matchup the Patriots look to exploit. WR Brandin Cooks CB Marcus Peters – Brandin Cooks makes his debut as the Patriots’ WR1, after earning an 80.5 overall PFF grade in his 2016 season with the Saints, and the eighth-best wide receiver rating of 119.2 among qualifying wide receivers. Cooks should move all over the offensive formation, and will match up with Marcus Peters whenever he lines up as the right wide receiver. Peters earned an 84.5 overall PFF grade last season, and his 0.16 yards allowed per cover snap was the 10th-best mark among 222 cornerbacks to play at least 27 snaps. RB Mike Gillislee LB Dee Ford – Mike Gillislee’s 2016 season earned him an 80.9 PFF overall grade, 13th-best among 61 running backs with at least 240 snaps. His 3.3 yards after contact per attempt in 2016 was the third-highest mark among 58 running backs with at least 247 snaps. When Gillislee runs outside of left tackle Nate Solder, he’ll see plenty of right outside linebacker Dee Ford. Ford had a run-stop percentage of 5.1 in 2016, tied for 37th among 57 linebackers with at least 105 run snaps. Ford’s 11.0 tackle efficiency on 275 snaps against the run was the 27th-best mark among 57 3-4 outside linebackers with at least 100 run snaps.